Lockless fixed-capacity queue for a single writer and a single reader. If the queue is empty, the reader is considered "blocked" and needs an out-of-band notification message to notice the next pushed item. Current implementation assumes that the writer cannot get blocked: if the queue is full, the writer will just not push and come back later (with a different value). We can add support for blocked writers if needed. Definition at line 88 of file Queue.h. Definition at line 75 of file Queue.cc. References Must, theCapacity, and theMaxItemSize. Referenced by Bytes2Items(), and Items2Bytes(). Definition at line 84 of file Queue.cc. References assert, maxItemSize(), and OneToOneUniQueue(). Definition at line 99 of file Queue.h. Definition at line 102 of file Queue.h. Definition at line 103 of file Queue.h. Definition at line 92 of file Queue.cc. Definition at line 97 of file Queue.h. Definition at line 382 of file Queue.h. Referenced by Ipc::FewToFewBiQueue::findOldest(), and Ipc::BaseMultiQueue::peek(). Definition at line 352 of file Queue.h. Definition at line 398 of file Queue.h. 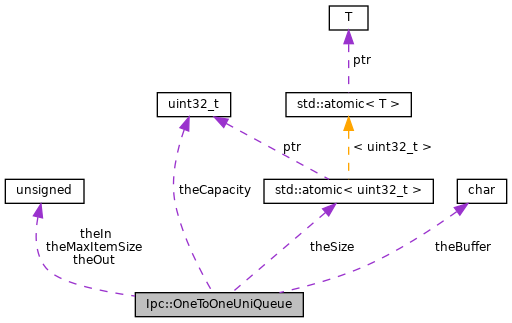 Referenced by Ipc::OneToOneUniQueues::operator(), and Ipc::OneToOneUniQueues::sharedMemorySize(). Definition at line 98 of file Queue.h. Referenced by Ipc::FewToFewBiQueue::findOldest(), Ipc::BaseMultiQueue::pop(), and Ipc::BaseMultiQueue::push(). Definition at line 126 of file Queue.h. Definition at line 119 of file Queue.h. Definition at line 123 of file Queue.h. Definition at line 120 of file Queue.h. Definition at line 122 of file Queue.h.